If you are looking to give your garden a bit of personality, or if you want a designated gathering space for outdoor parties, pergolas are a great way to go. The traditional pergola consists of four wooden columns and a trellis-style roof. If you have some landscaping and carpentry skills, you can build your own pergola in about a day and a half. 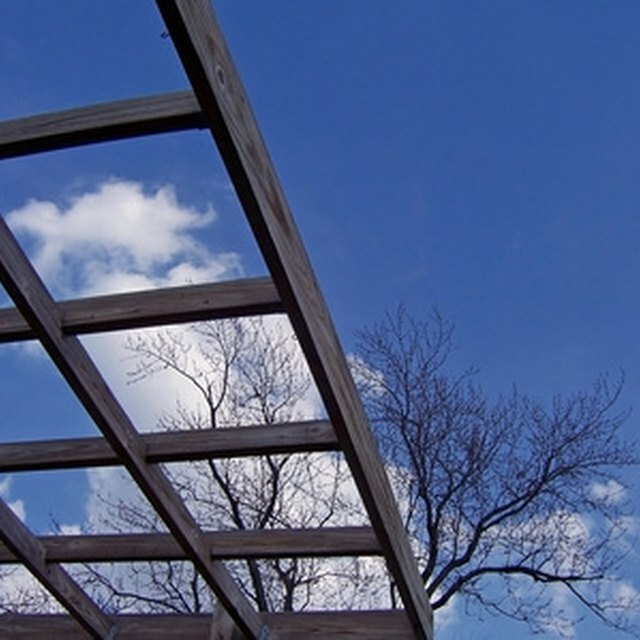 The first thing to decide is where you want your pergola to go and its dimensions. The traditional pergola will have a rectangular shape, with the front and back of the pergola, and the sides of the pergola, the same length. Measure out dimensions in your yard or garden and temporarily mark the corners with stakes. This will be the location for your wood columns Your measurements can vary depending on how tall and wide you want your pergola. But here is an example to get you started for a 12-by-14-foot pergola. You will need four 10-foot long posts for the columns, eight wood crossbeams that are 18 feet long, four wood beams at 16 feet long, and 11 wooden rafters When it comes time to purchase the wood, consider soft woods such as cedar. Not only is cedar easier to cut, but it has natural properties that repel insects. Once you have measured out the rectangle, dig a 2-foot-deep hole at each corner. Fill the holes with approximately 6 inches of gravel and place the 10-foot long posts in each hole. Keep the posts steady. To help, consider attaching temporary wood braces to keep the posts in place Next, mix concrete and pour it into each hole until it reaches the soil line. Smooth out the concrete, remove any air bubbles and let it harden. This will take about 24 hours. With the columns set in place, you can begin working on the top of the pergola. For this example, the front and back of the pergola will be 12 feet wide, while the sides are 14 feet wide. On the 12-foot sides of the pergola, measure 725 inches down from the top of the post and make a mark. Do this on each side. This mark will be the location for the four main beams that will hold the trellis roof. Next, drill a 16-foot long beam to each of the 12-foot sides where you made the 725 inch mark. If you did this correctly, you will see that the 12-foot sides of the pergola are sandwiched between the columns. The crossbeams go on next. These crossbeams are installed right above the 725-inch mark where the main beams were installed. Take two of the 18-foot long crossbeams and place them running in the opposite direction of the main beams. They will run along the 14-foot section of the pergola. Drill the crossbeams into each side of the post. Once you have finished on one side, move on to the other side. Again, the post will be sandwiched between two crossbeams. You will now notice that you have a rectangular shape attached to the top of the columns. Now it is time to give the pergola its trellis roof. This will be done with the remaining cross beams and the rafter. Take four, 18-foot long crossbeams and add them as internal crossbeams. Evenly space each crossbeam. These will be attached to the top of the main beam by drilling a wood screw at an angle through the crossbeam and into the main beam. This process is repeated for each beam Above the internal beams will be 11 rafters. They will run in the opposite direction as the internal beams to create a trellis look. These rafters also need to be spaced out evenly to give it a clean look. Each rafter will be attached to the crossbeams with 5-inch wood screws.